Networking, shaking hands, and meeting new people is a great way to drum up interest in the speaking or book signing events you can offer as an author. But your author website can be equally effective at nabbing you some new invitations to speak—if you’re using it right. Imagine: You could be lounging around in sweatpants, binge-watching Netflix, while your author website is hard at work scoring new book promo invitations and more speaking gigs on your behalf. By expanding your reach through author speaking gigs and appearances, you grow your audience and potentially sell more books. 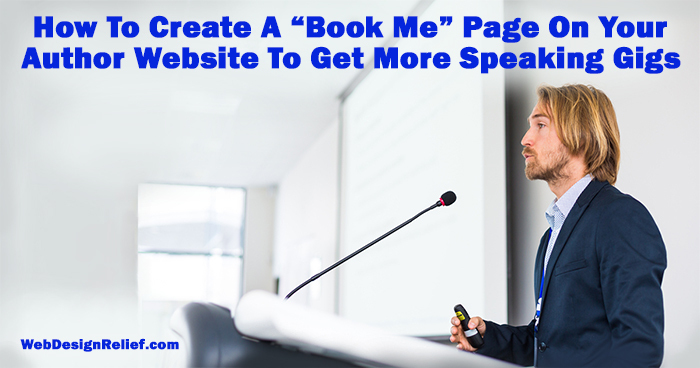 An exciting, effective “book me” page on your author website can help make that happen! Pinpoint your target audience. Are you hoping to score more invitations from book groups made up of casual readers? Or are publishing pros your target market (like booksellers, writing groups, librarians, etc.)? If your answer was something like “uh, both?” then you might want to consider creating two separate web pages: one customized for each audience. Or consider dividing your “book me” page into different sections. Why? Writing group organizers and librarians may be looking for different takeaway value from your speaking gigs than casual book readers. Define your call to action. What action step do you want website visitors to take when they stop by to consider booking a speaking gig or call-in with you? Do you want them to reach out to you directly using your contact form? Or would you rather add them to your author mailing list (and then reach out to your subscribers regularly to let them know about new offerings)? Once you know exactly the step you want your visitor to take, be sure to make it easy for them to take that step. Make the most of your headshot. People who are interested in meeting you might be more inclined to reach out if your author headshot (photo) shows a friendly, approachable face—you know, the face of a person who is going to be interesting, clever, and thoughtful. If your writing style is more serious or eerie and sinister, feel free to turn down the wattage on your grin for a look that’s more mysterious and intriguing. Whatever the mood of your author brand, use your author headshot to boost your personal interest factor. Learn more: Your Author Headshot: How To Create A Flattering (And Affordable!) Portrait For Print And Online. Offer a gift basket with book-related items and goodies for book club groups. Host a fabulous prize giveaway that attendees can opt to enter (plus, you can collect email addresses for your subscriber list). Give a free critique to one lucky listener/attendee (great for writers groups). Volunteer to donate a portion of any proceeds to a related charity (aka cause marketing for authors). Promise promo. Sometimes, overworked organizers aren’t able to drum up a lot of pre-event promo—but they LOVE the idea that you might enthusiastically drive new visitors through their doors. You might want to note on your author website that all of your events come with a free prewritten press release, flyers, social media promotion, etc. Brag by number. If you’ve hosted events with huge numbers of attendees or you have a healthy social media following in your region, organizers would be interested in your fledgling fame and promotional reach. They may be more inclined to host your event if they sense you already have a strong following. Let’s go to the video. Posting a small snippet of a presentation you’ve given—or even a video of yourself inviting others to reach out to you—can go a long way toward demonstrating your likeability factor. But don’t stress about it! Your video doesn’t have to be fancy to be effective. In fact, some companies have deliberately dropped high-production, slick videos in favor of clips that have a homemade, authentic vibe. But if video makes you look nervous and uptight (because, hey, we can’t all be nightly news anchors), then just skip it and embrace a medium that works for you. Picture this. You know what they say: A picture is worth a thousand words. A photo or two of you at your events either with fans, standing in front of a crowd, signing books, etc., could hint at the promise that a great time will be had by all. Make it easy for event organizers to contact you—the more hoops people have to jump through in order to connect with you directly, the more likely they’ll say “forget it” before they manage to knock on your door. That said, we do not recommend publishing your personal email address on your author website. First of all, you’ll want to protect your privacy. But secondly, spammers will be flooding your published email address, and you won’t be able to tell which emails are from humans and which are from spambots. So you might miss out on an important contact. Instead of broadcasting your personal email address, invite visitors to fill out a contact form, preferably with a CAPTCHA-type security measure in place to vanquish web-trolling robots. Then, be sure to take careful precautions when moving forward with any author speaking gig: Only agree to visit reputable, safe organizations or restrict in-person lectures to public places. Once your book promotion event is booked, brush up on your book signing etiquette, pack your books and your enthusiasm, and go have some fun! Question: What strategy do you find is most effective for nabbing author speaking gigs? 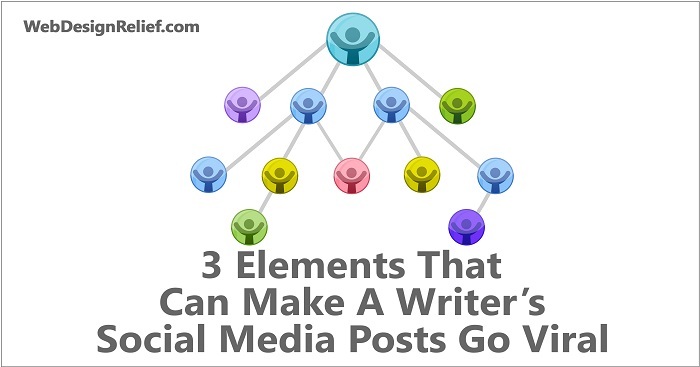 As a marketing-savvy author, you know building a social media platform is vital to your writing career. That’s why you post frequently, respond to all comments, and monitor your social media platforms throughout the day. 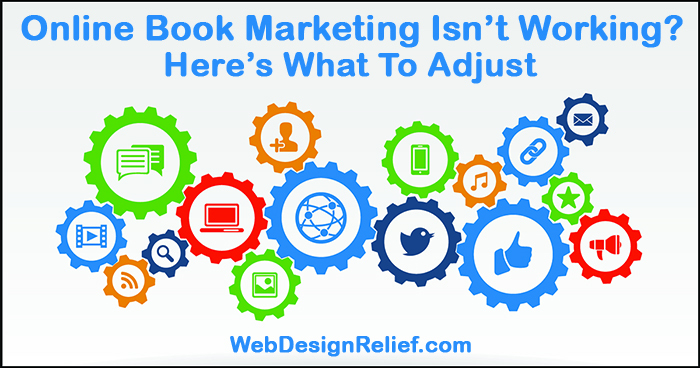 But at Web Design Relief, our experts know that sometimes your online book marketing strategies don’t show any real results. What should you do when the number of your fans and followers flatlines—despite all your best efforts? One of the best ways to increase engagement with your current followers and fans is to ask questions! Quick, easy-to-answer multiple-choice queries grease the ease of engagement. E-books or print? Vampires or werewolves? Coffee or tea? Sometimes a simple question gets the best results. Another way to keep your fans engaged is to always be upbeat, even when sharing less-than-happy news. A positive outlook is always appealing. Fans and followers will respond to your optimism. Data suggests that across social media platforms, posts with graphics get more attention than those without. If the thought of wrestling with the knotty tangle of photo copyright restrictions makes you twitch, consider checking out some free or low-cost graphic-design-tool websites such as Canva or BookBrush to create the most eye-catching posts you can. Another good strategy is to post your own graphic quotes using Quozio. Numbers and statistics might make your head spin, but they can help you determine what to post for maximum engagement, and when to post for maximum exposure. For Facebook, go to the Insights tab on your business page for information about which posts have the greatest reach and data about when your followers are most active. For Twitter, check out impressions and engagements of a particular tweet by clicking on the three vertical bars icon under the tweet. Or check out “Analytics” on the drop-down menu beneath your Twitter profile picture. Instagram business profiles have an “Insights” feature that will give data on posts, stories, and your audience. Using data from the analytics above, you can magnify your reach on Facebook by boosting your best posts. Facebook allows you to pay to “boost” posts so that they will be seen by more of your followers, their friends, and other possible targets based on age, gender, location, interests, etc. You can choose the duration and the budget, which can be as short as one day and as affordable as one dollar per day. You can also pay to boost Tweets and Instagram posts too! Although one of the ultimate goals for building a social media following is to sell your books, constant posts that scream “buy my book!” will only drive followers away. Instead, promote your book by building interest in you as a writer and the story itself. What first interested you in the setting or the premise of the book? Where did the first germ of the idea come from? Share stories about how you came up with character names, or why you hope your nonfiction will help people with a specific problem. The more your followers feel involved with the story and the process, the more likely they’ll respond when you finally do ask them to buy your book. Facebook author pages allow you to schedule your posts. Use the drop-down menu of the “Publish” button on your post to access the scheduling feature. Check out TweetDeck for scheduling Twitter posts. Look into Hootsuite for scheduling across multiple social media platforms. Online book marketing can easily become overwhelming. Many companies hire whole departments of social media professionals to promote their brands. But there’s only one you, so be sure to avoid social media burnout by focusing on what’s really important: writing more books. Question: Of your recent social media posts on any platform, which post has had the largest level of engagement, discussion, or sharing? In today’s crowded publishing marketplace, an author who wants to get noticed has to do more than just sit at a desk and write. You need to be active on social media in order to build your fan base. But the experts at Web Design Relief have noticed that recent algorithm changes on the major social media platforms have made it harder than ever to connect with all of your followers. So how can you reach more people with your social media posts? The answer: Create posts that could go viral—get shared by a lot of people way beyond your initial list of followers. And while getting a post to go viral isn’t easy (they’re more the exception than the rule), we have some ideas that may tip the odds in your favor. If there’s one thing that’s going to make your followers hit “share,” it’s laughter. Readers will enjoy discovering that you’re not just a “writer” but also a real person with a funny bone. If you can inject your sense of humor into your social media presence, you’ll increase your odds of building your following faster. Better yet, you’ll be gaining new fans who will be more likely to keep coming back for more. Sharing intriguing facts and trends that your audience will be interested in can also help boost the share-power of your social media. Just be careful about stating overly controversial opinions. While these types of posts may get a lot of traction, they can also attract trolls and negative feedback. Unless you write political pieces designed to ruffle feathers and that’s what your readers expect from you, it may be best to steer clear of topics that might alienate some followers. It’s no secret that celebrity and social media go together like peanut butter and jelly. If you’re Stephen King—thanks for reading this article, Mr. King—almost any of your tweets or posts have a much greater chance of going viral than those of less famous writers. If you’re friends with someone who has more Internet influence than you, be sure to include their Twitter or Instagram handle, Facebook link, etc. when you’re referring to them. And if you have a photo of you and your celebrity pal chowing down at the local hamburger joint, be sure to post it! Having an image in your post makes it even more likely to be shared. Not rubbing shoulders with anyone famous? A celebrity quote or birthday shout-out to a literary icon might still wow your readers. Even if your social media never goes viral, using these tips will help your posts and tweets pack more punch and appeal to more of your followers. And if you’re feeling a little lost in this brave new world of promoting your writing online, you’re not alone. Managing the marketing side of writing doesn’t come naturally to many writers. The good news is that we can help you with your online presence, from building an author website to even managing your social media accounts. Question: Have you ever had a social media post go viral? What technique did you use?